A problem that most bathrooms encounter will revolve around odors. That small confined space can easily trap unpleasant smells. Thankfully, we have air fresheners to help solve this issue. One of the most convenient methods to maintain that pleasing aroma inside the bathroom is by using the best automatic bathroom air freshener that releases a small amount of deodorant at a set interval. Automatic Air Fresheners are a hassle-free way to keep your bathroom smelling fresh. One good example of this is the Glade Automatic Spray Air Freshener Kit. 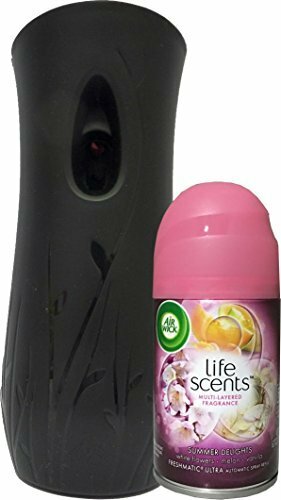 We chose it because is it the refills are also compatible with other brands (including the Lysol and Air Wick models we review below), so it gives you a lot of flexibility and choice of scents if there are certain fragrances that you are not particularly fond of. But that is not the only option you get in this category so we’ve have found a couple more bathroom deodorizers that we recommend if you want to check out some of the other air fresheners below. While some consumers have questioned if these air fresheners are safe, the automatically dosed amount may actually be less harmful than if you spray from an aerosol can since the automatic ones give a very small puff of freshener at timed intervals but they still do contain some ingredients that can be concerning if you are trying to maintain a toxic-free home. If you are looking for other more natural ways to keep your bathroom smelling fresh click here. Whenever possible, we try to use natural household cleaners and stopped using these and started to use these Air Wick Essential Oils Diffusers, the concept is the same as the automatic fresheners but uses natural essential oils instead. They also work on a timer to release a small amount of mist at determined intervals. Our first entry into this list, the Air Wick Automatic Air Freshener Start Kit comes with one extra refill and the dispenser. You can choose from several scents such as warm breeze, salty sea spray, and sun-bleached driftwood. The dispenser comes with a setting that allows you to change the fragrance level. This is a nice inclusion for those who have a sensitive sense of smell. The product claims to have a 60-day lifespan per refill with each delivering up to 2,400 sprays. Pleasant scent with adjustable fragrance levels. The plastic dispenser is rather cheaply made. 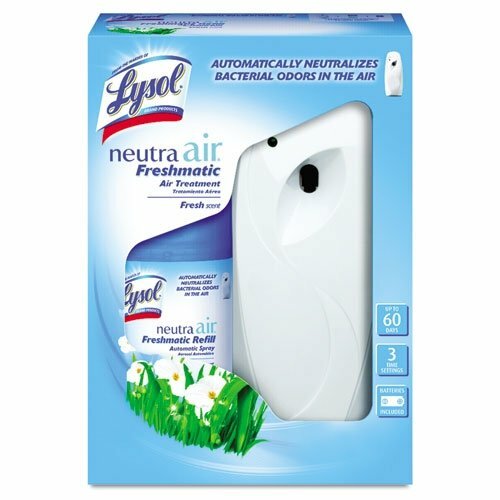 This automatic air freshener kit from Lysol comes with a, a refill, and 2 AA batteries. The refill is advertised to last for as long as 60 days. The 60-day lifespan applies if the automatic dispenser is set at the lowest setting. Lysol is a well-known brand in this category so you can expect this product to be as reliable as they come. It is also ideal for use not only in the bathroom but also in other parts of the house. I suggest you adjust the dispenser to the lowest one setting as the scent can be quite overwhelming, especially in a small and enclosed space. The dispenser is compatible with both Glade and Air Wick refill cans as well. One bottle can last up to 4 months max if the dispenser uses the lowest setting. The spray dispenser is quieter compared to other models. The scent is mild enough to prevent nose irritations. The spray leaves a thin sheen on the floor, although it can easily be wiped off though. One thing I took away at this from first glance is the dispenser’s decorative aesthetics. The kit comes with the dispenser, batteries, and a refill spray. The dispenser is designed to be easily installed with its easy to open the latch. The dispenser also comes with some nifty features like a time setting and fragrance boost button. One of the nice things about the dispenser is that it comes with refills in six different fragrance options which is more versatile than some other competing brands, this is a nice feature as you can change from one sent another if you get tired of the same scent. For example, you might want a more flowery smell in spring such as “Floral” and a warmer, earthier smell such as “Gourmet” in the colder months. Click here for more details and ingredients. The time settings allow you to choose how often you would like the dispenser to activate. This is a great feature if you want to save the refill spray for optimum longevity. The boost button adds an extra explosion of fragrance if needed, for example, if you have extra guests staying over or are having a party when the bathroom is getting more traffic use than normal. The dispenser is compatible with Lysol Neutra and Air Wick Freshmatic Refill sprays. Timer setting allows you to optimize the longevity of each refill spray. The spray can last up to 60 days if the time setting is at the 36-minute dial. Boost button comes in handy when you need to increase the fragrance. 6 scents available: Clean, Floral, Fruity, Gourmet, Outdoor, and Tropical. The smell that your home truly deserves is no smell at all. If you still are having difficulties in achieving that goal, or if you still haven’t found the safest natural option for you (or both), then worry not. Below are the best air purifying options for your home. 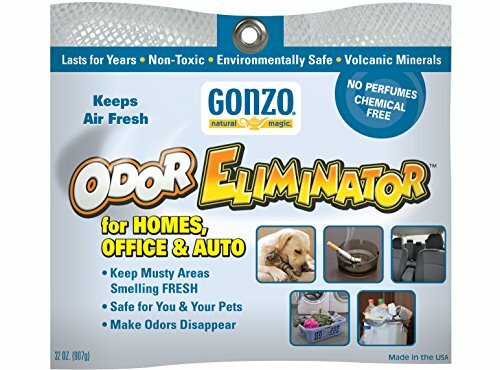 Gonzo Odor Eliminator Rocks are composed of non-toxic, volcanic substances scientifically proven to be effective in absorbing both odors and moisture in an area. For this reason, they are considered a suitable replacement for your typical air freshener, a “home improvement product” known for its nausea-inducing citrus smell which blends with the odor instead of eliminating it. This product is easy to use. First, remove the plastic covering the net bag that contains the rocks. Remove the plastic above a wastebasket as the net bag also has loose particles. Afterward, place the net bag near the location of the odor. It’s a long-lasting product. Place under direct sunlight every six months so the rocks can absorb bad odors again. The product contains no allergens. They are safe for kids, adults, and pets. Works even without a container. You will need more net bags of this product for bigger spaces. The loose particles can get everywhere in no time if you’re not careful. 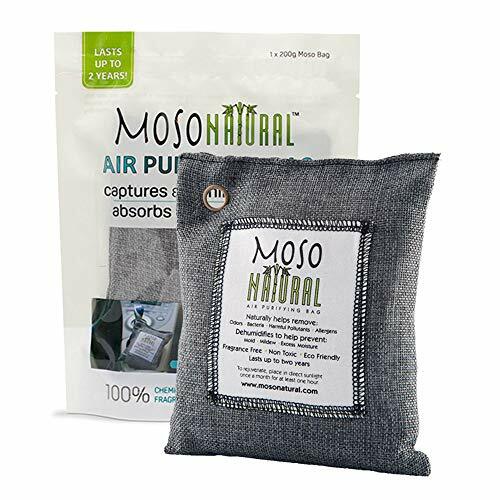 Each Moso Natural Air Purifying Bag is a straightforward solution to odors, as it is a cloth bag that contains just one ingredient: Moso bamboo charcoal. 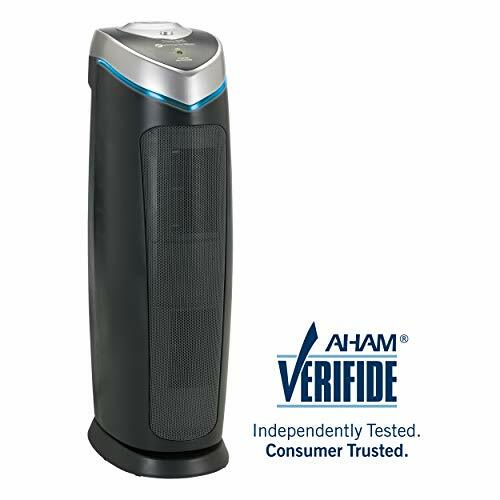 This charcoal type is an incredibly powerful air purifier—each piece of charcoal contains millions of microscopic pores capable of attracting and absorbing not just odors and moisture in the air, but also airborne chemicals and bacteria. To use this product, you need to place one bag in a stinky area. In less than a day, the spot will be dry, fresh, and have no odors. The product is reusable for up to two years. The bag can be easily moved from one place to another. The bamboo charcoal is sealed in a beautiful, stylish linen bag. Can become an amazing garden addition after two years of use. Just cut the bag open and sprinkle the product into the soil. Bamboo charcoal can help plants in absorbing nutrients and moisture. It can take quite some time to work. For some homeowners, two years of use is a short time. It’s a fact of life that poop stink sticks around. Unfortunately, many bathroom cleaning chemicals today have overpowering smells, not to mention harmful fumes. Good thing odorless poo spray is available in the market these days. Squatty Potty Unicorn Gold Toilet Spray is not the kind of spray that just masks the smell of poop. 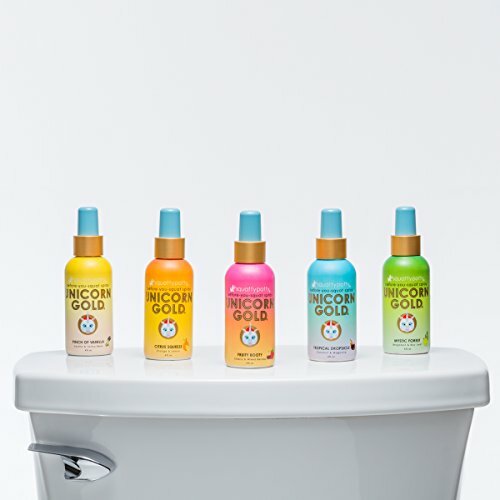 It uses real gold nanoparticles and essential oils, which are capable of trapping odors below the toilet water and are just as capable of eliminating stink molecules above water. When sprayed above toilet water, the gold content instantly eliminates the nasty sulfur compounds which make poop smell bad. Sprayed to toilet water, the product seals in the water line so odors are trapped underwater. The product then binds to sulfur to remove the stink. The smell of essential oils is then released. Want to add scent to your home? An essential oil diffuser might be just for you. This home essential disperses health-boosting oils to the air. Studies have shown that these oils have a positive impact on both the brain and nervous system in that they aid in relaxation and boost mood. Use this product to add in relaxing fragrance into your home. All you have to do is to pour a mixture of essential oils and water into it, and then switch on. If you’re looking to use this product as a humidifier, however, just add in some water and switch on. In no time, you will feel the moisture in the room. 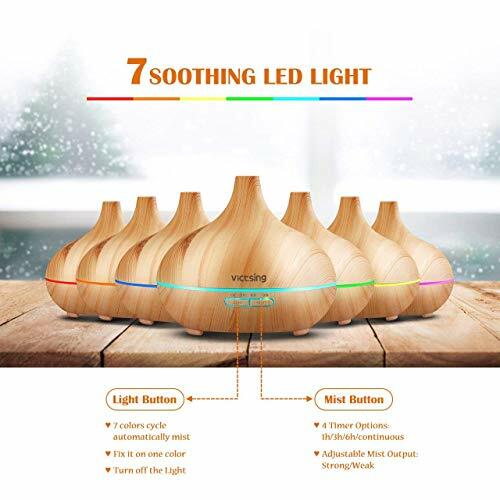 This aroma diffuser is capable of running for six to eight hours provided that 300ml (10 ounces) of water has been poured into it. Once the water content runs out, the diffuser will automatically switch off after five seconds. 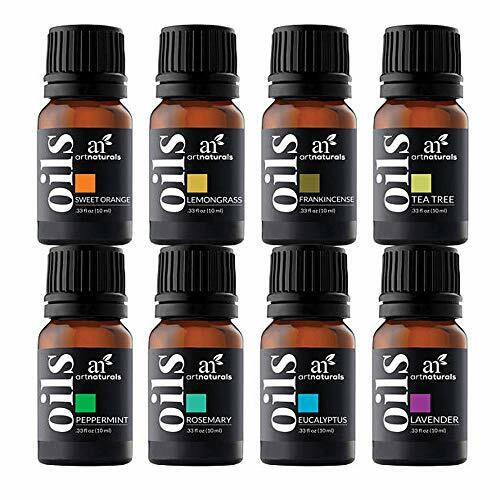 This essential oil gift set is a set of unadulterated, pure, therapeutic grade essential oils. When each is used along with a carrier oil, the scent that is produced can help ease the pains and stresses of a vigorous day. It’s also worth mentioning that the oils in this set can boost skin, nail, and hair conditions, an uncommon feat in the essential oils industry. When used together with a diffuser, each oil in the set can add a mood-boosting, relaxing, and satisfying scent in the room. It’s another great way to end a day of hard work and stress. Odor absorbing gels are yet another innovative way to eliminate room odors without masking the foul odors. Most products of this type in the market look no different from car air fresheners, making them easy to move around the house or office as needed, not to mention easy to hide. If you’ve always wanted an odor-removing product that can actually remove just about any odor known to man, this product is your best bet. 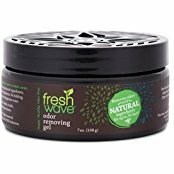 Here’s why: its combination of natural ingredients is capable of removing any odor ranging from pet odor to skunk odor, and even more. It looks no different from the typical air freshener that you can find in the market. The product is inside a small solid container that is easy to move around the house or office when you need to. It’s also worth mentioning that it is easy to hide in corners or out of the way if you want to keep it hidden from guests. Features a pleasant scent not too different from eucalyptus. Some users have reported that the product can remove moisture as well. The eucalyptus- or pine-like scent is quite strong when first opened. The scent mentioned above can take time to get used to. It’s a fact that the air we breathe isn’t exactly clean. Science has proven that we also breathe in airborne microscopic solid particles daily. Unfortunately, the body sometimes fails to filter out these particles, resulting in diseases or allergic reactions. Good thing these air purifiers or deodorizers can prevent them. … despite the fact that it’s a lightweight standing at 22 inches tall! 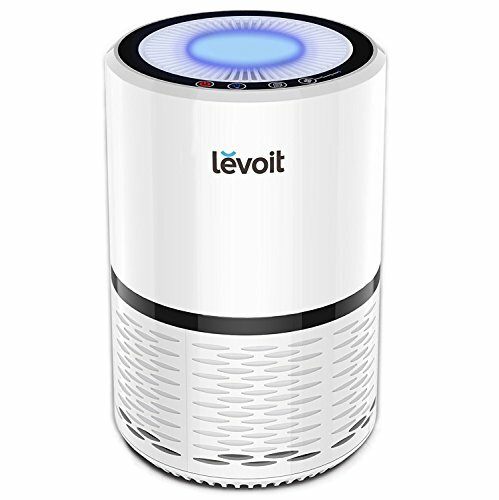 Aside from its air-purifying capacity for its size, this small purifier is also an amazing product because it’s best for rooms measuring up to 167 square feet! It’s a powerhouse you shouldn’t miss out on! It saves space as it is small and lightweight. It can purify the air in three different ways. It can purify the air in a large room. Its powerful features mean it consumes more power than other models. The product’s filters aren’t washable and need to be replaced after six months. Its main feature is a three-stage filtration system: pre-filter, followed by a TRUE HEPA filter, then activated Carbon filter. This filtration system is capable of removing up to 99.97% of smoke, dust, allergies, mold spores, odor, pet dander, and pollen, not just because it is efficient, but also because the product’s filters are capable of removing dust that measures 0.3 microns and larger. It also features three-speed settings and operates quietly at night. A night light built into the product ensures safety for everyone when lights are off. The product looks futuristic and is fitting for the 21st Century house. Modern appearance, perfect for the 21st Century home. The product can only filter a single room. There are many ways to improve how a house smells, and if you’re in search of a space-saving method of doing so, the use of reed diffusers is the way to go. All you need are the reed diffuser, the reed sticks, essential oils, and a highly suitable desktop space. 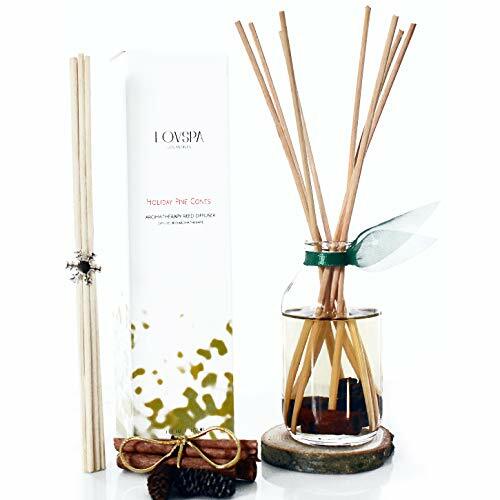 The LOVSPA Cinnamon Pinecones Reed Diffuser Oil Set is the best replacement to scented candles, room spray, and potpourri for a number of reasons. First, neither flame nor electrical power is required to get the most out of this product. Second, the whole setup is easy to assemble on any big or small space provided that you exercise caution when opening the tight cork. Third, even the small space of the bedside table is a suitable space for a reed diffuser—the setup is minimalist! Speaking of minimalist, it’s also worth mentioning that the product is perfect for minimalist homes. This setup is compact and can fit any space big or small. You don’t need a flame or electrical power to benefit from this product. Be careful when opening the cork as it is tight and oil can spill out. Remove cork by moving side to side while you slowly wiggle upwards. Some users report that the smell isn’t strong enough. P.S. If you are dealing with that “rotten egg” smell in your bathroom, click here for some simple solutions. Bathroom Air Fresheners can help keep odors away with less hassle. Before we head on to our list of best plugin air freshener for home use, I would like to first give you some tips on how to choose the best one. This is to help cover the bases in the instance when you can’t find the ones we recommended on this list. An important aspect of any automatic air freshener dispenser is its timer setting feature. How often does it spray the deodorizer? If your bathroom is relatively small, you can opt for a dispenser that sprays in-between long intervals. The smaller the room, the less amount of air freshener it will actually need to maintain a pleasant scent. If you have a larger bathroom, an air freshener dispenser that you can set to spray regularly (every 30 minutes or so) should suffice. Always choose refills that have a long lifespan. Cheaper brands will usually have a lifespan of a month before you need to replace the air freshener can. Refills from known brands like Glade can deliver up to 60 days of continuous use before it runs out. This should help you in the budget department as you won’t need to replace the bottle every month. Wouldn’t it be great if you can switch up your choices of air freshener brands while using a universal automatic dispenser spray? This is one feature that can save you cash. Some dispensers are compatible with a multitude of other refill cans from other brands. This will give you a lot more option in terms of scents for your bathroom. If you can find one that offers a dispenser that has this feature, definitely put that in your shortlist. Hopefully, this article helped you narrow down your choices for the best bathroom air freshener. When looking for the best plugin air freshener for home it is important to have a high-quality dispenser. The dispenser will be the major factor when it comes to the longevity and reliability of the air freshener. 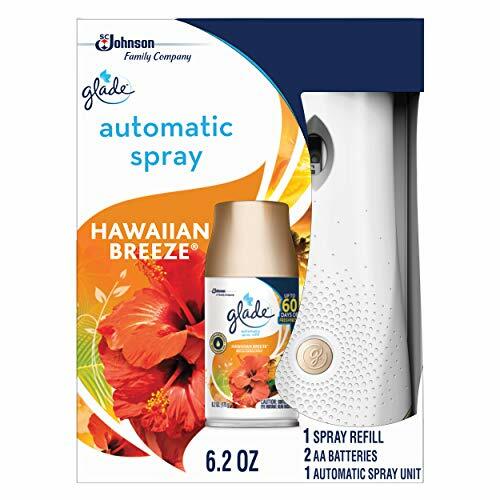 In that regard, Glade Automatic Spray Air Freshener takes the proverbial cake as it is sturdy and comes with a few great settings for added flexibility and longevity.